Thanks Sherry~ Congratulations on being the first person to ever comment on the blog! Crazy busy with work this week but will get back to continuing the blog soon! @EftychiaThank-you Eftychia! 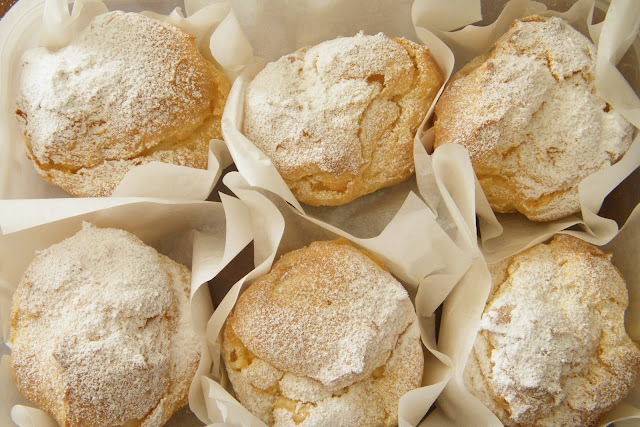 I'm sure your cream puffs will turn out great because your cakes look fantastic! Hi.. I m a great fan of your blog.. Your secret stalker I guess.. Always wanted to try out your pie shuu crust.. but still to no avail.. Promise u that I will try out d recipe in these one or two days.. Kindly allow me to copy out d recipe for my 1st trial of d pie shuu crust.. I m very familiar with cream puff recipe, but not with the pi shuu crust.. I will definitely back-link to you should I post an entry of d above.. I worked at Beard Papa Brisbane store, for our custard you half corn flour half plain flour and it will taste more like our custard. we would beat the sugar, vanilla and egg yolks then add the flour while the milk was heating. then add some hot milk to the bowl and beat then add all the bowl back into the rest of the hot milk then mix till it thickens then take of heat put in butter and wait for it to cool. then mix in whipped cream. keep do a good work like this one. btw thank for sharing .